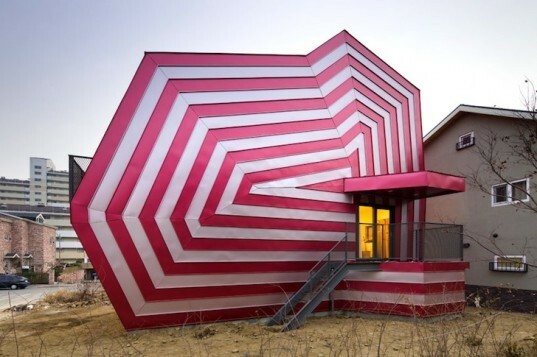 Architect Moon Hoon sent us images last night of his recently completed swirling candy-colored Lollipop House, and we couldn't wait to share them with you! Hoon chose timber and metal over the standard concrete construction so common in South Korea, and he used a wood platform framing technique borrowed from Canada. The seven-storey interior concealed by the exterior red and white metal cladding is filled to the brim with daylight, which combined with insulation and radiant heating slashes the home's carbon footprint. 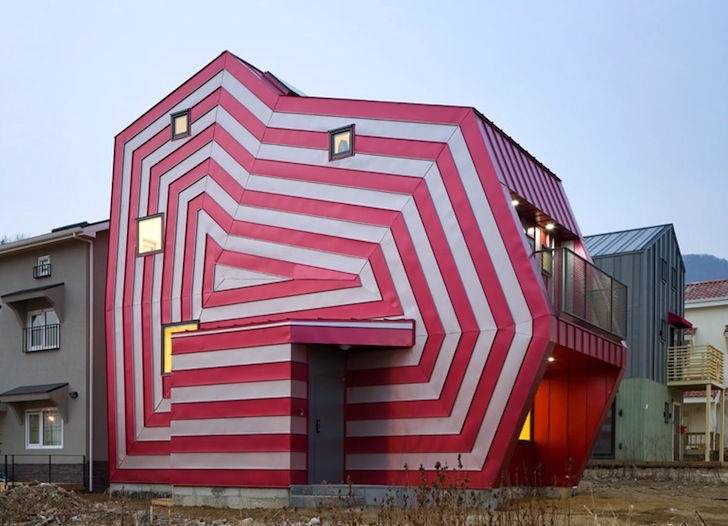 Unlike many other homes in South Korea, the Lollipop House is not constructed out of concrete. According to Hoon, timber framing allows for faster construction, and lower costs. He adds that “The wood and metal is easily recyclable and less difficult to demolish when compared to concrete.” These material changes ensure that the home is more affordable initially, while its energy efficiency ensures that its long-term maintenance costs are also lower. The Lollipop House boasts an “Ondol” or radiant floor heating system that is only used to heat the home. It is easy to install and uses very little electricity. Wood studs allow for decent insulation, which is often neglected in concrete homes, which in turn results in significant energy savings since it’s rarely necessary to use the boiler. The interior is connected by a spiral staircase that opens to a different function on each floor – all seven of which are drenched in daylighting pumped in from rooftop skylights. Hoon claims that the Lollipop house is cheaper both in the short and long term. This sketch reveals the initial thought process behind the home.